Evonsoft Advanced Spyware Remover is a highly performance malware and spyware removal program that detects and removes the deepest infections from your PC. Advanced Spyware Remover has the ability to block over 100,000 known spyware and Internet threats from ever being installed in your computer, block thousands of malicious websites to protect your online privacy and improve computer security. With the advanced and smart scan engine, Advanced Spyware Remover can detect the most malicious and complex spyware and malware in fast and efficient way. Advanced Spyware Remover is a foolproof anti-spyware tool that removes spyware, adware, trojans, keyloggers, bots, worms, malware, hijacker programs and immunizes them to block future spyware threats that may invade your privacy and even steal your credit card numbers or personal information. Moreover, Advanced Spyware Remover is developed to work with all antivirus for a superior PC security. It upgrades computer system performance and creating a secure computer that runs reliably. 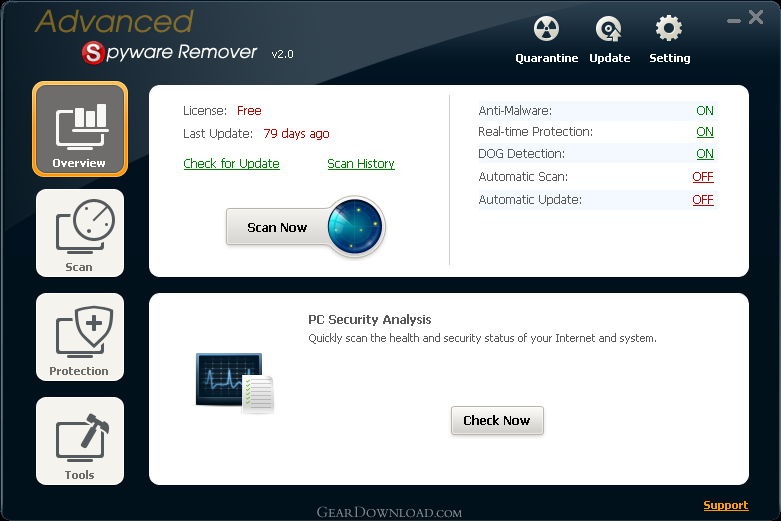 Advanced Spyware Remover is a all-in-one application. With additional tools such as hijack scan, passive defense and etc, Advanced Spyware Remover helps protect and clean your computer and remove various of potential spyware and malware from your PC easily and effectively. Advanced Spyware Remover is a 100% freeware, it helps you remove spyware from your computer within 5 minutes and block future spyware threats with one-click! This download (asr-setup.exe) was tested thoroughly and was found 100% clean. Click "Report Spyware" link on the top if you found this software contains any form of malware, including but not limited to: spyware, viruses, trojans and backdoors.